Hey, Millennials, are you enjoying living in your own space and being independent? Independence brings with it a lot of responsibilities, including keeping a clean and tidy home, but the freedom is definitely exhilarating. Adulting is an adventure. Here’s a cheat sheet to help you get on with it. 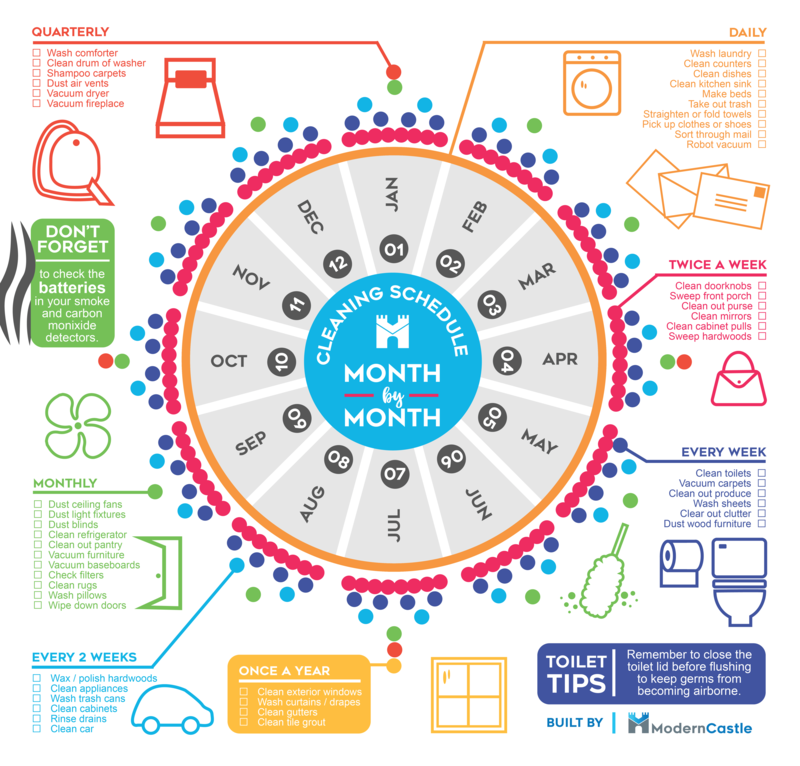 Gerrard Lee of ModernCastle sent us this infographic to help us with scheduling what chores needs to be done when. I don’t do all of it because work is demanding. What free time I have, I’d rather spend doing fun things with family and friends rather than wiping down doors or cleaning cabinet pulls. But I do keep a very tidy home because it just feels good. Ages ago I read somewhere that clutter is bad feng shui because the chi (life energy) cannot flow freely around the house. I don’t know about that but clutter does affect me negatively. Whether it’s my mental or physical state, I wouldn’t know. I just know I don’t like a messy home. It puts me in a bad mood. IN 2014, lifestyle expert Marie Kondo came up with the KonMari Method in her book The Life-Changing Magic of Tidying Up. Several other books followed, as well as workshops, speaking engagements, videos, etc, and now she even has an app. One thing that I remember is how to choose what things should stay in your house. Just hold up a thing and ask yourself if it still gave you a spark of joy. If not, get rid of it. I don’t know if you can be that ruthless. I know I can’t. Still, I try my best every day to declutter my home, make my bed, clean the kitchen sink, take out the garbage, etc. If you do these things automatically, especially making your bed in the morning, chances are you really can maintain a clean home. Good luck then. I’ll leave you to it.